Chen Meng has won the Women’s Singles prize at the Seamaster 2017 ITTF World Tour Platinum German Open in Magdeburg with a seven games victory (9-11, 8-11, 13-11, 9-11, 13-11, 11-9, 11-4) over fellow Chinese compatriot Zhu Yuling in what turned out to be a thrilling final on Sunday 12th November. 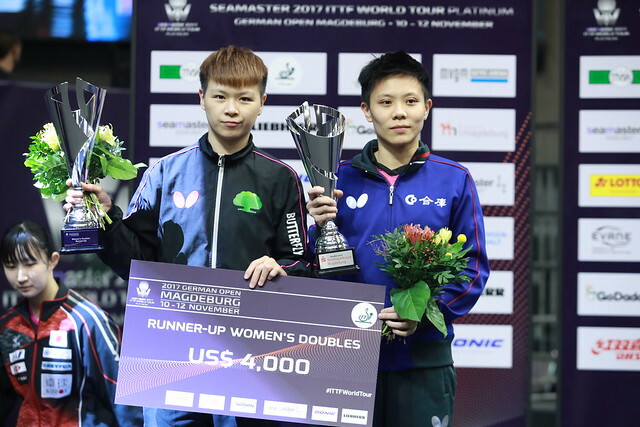 Women’s Doubles partners earlier this year in Düsseldorf at the Liebherr 2017 ITTF-World Championships, but on the concluding day of the German Open in Magdeburg Zhu Yuling and Chen Meng were most certainly rivals. Occupying the top two positions in the seeding list Zhu Yuling and Chen Meng entered the tournament as the two major contenders for the title and so it was rather fitting that the two competitors would meet in an exciting play-off for the gold medal. The spectators were treated to a fantastic duel between the top two world ranked players as the full match distance was required to decide who would lift the trophy. Claiming the opening two games Zhu Yuling had a great opportunity to establish a three games to nil lead when she moved 9-6 up in game three, but a superb comeback saw Chen Meng steal the game win in deuce. Another close game followed as the top seed restored her two games advantage and with Zhu Yuling leading 9-7 on points in the fifth end the title win was just two points away. However, Chen Meng responded positively yet again, recovering to extend the match. Then came what was arguably the most important moment of the entire match as Chen Meng came out on top in an incredible attacking rally to take game six by a two point margin. The momentum had completely shifted in the direction of the Chen Meng and a crushing performance in the deciding game completed the dramatic comeback for the 23-year-old. “I’m very happy to be able to win the title at German Open… When I was trailing 1-3 , I did not give up and kept thinking of solutions on the court. I think now it’s normal to be 0-2 or 1-3 behind in matches. There were already two occasions this year where I lost the match when having a 3-1 initial lead… so I think I have learnt my lesson this time”, Chen Meng. Chen Meng wins her third Women’s Singles trophy of the 2017 ITTF World Tour, having won the gold medals at the ITTF World Tour events held in Qatar and Australia. Finishing in the runner up spot means that Zhu Yuling remains without a Women’s Singles title on this year’s World Tour, but was the successful player at the recent Uncle Pop 2017 ITTF Women’s World Cup presented by Polar Naturals.